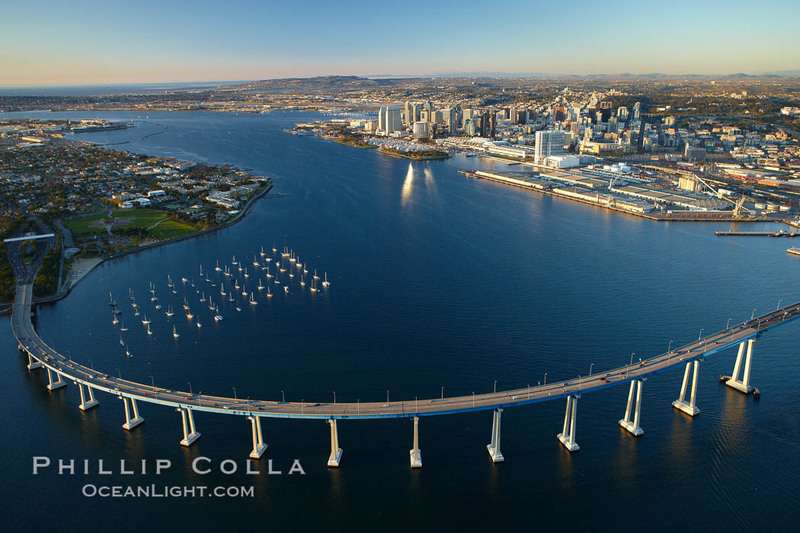 One of the most striking sights during our flight over San Diego was the San Diego – Coronado Bridge. Arching high over San Diego Bay, the Coronado Bridge connects San Diego with the “island” community of Coronado and North Island Naval Air Station. Coronado is not truly an island as it is connected with the mainland with the long, skinny Strand, but approaching Coronado along the Strand requires a long detour through Imperial Beach. The Coronado Bridge was built high enough that large Navy boats can sail beneath it. And the bridge sections are designed to float so that, in the event that a disaster occurs and the bridge is destroyed, the bridge pieces can be easily moved out of the way so that Navy vessels can move quickly through the area. In this photo looking north, Coronado Island is seen to the left and downtown San Diego to the right. See more of our San Diego Photos.